If I’ve said it once, I’ve said it a million times: EVERYTHING TASTES BETTER IN A WONTON CUP. Ok, so I’ve actually never really said that but I’m going to start because it is true and these hot pizza dip bites provide impeccable proof. Meant to be a family-style dip, my sweet blogging friend, Kim (in MD! 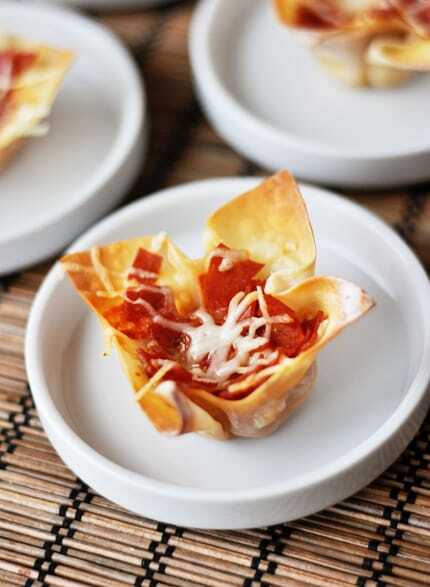 ), sent me the recipe for Hot Pizza Dip, adding that she has made it into bite-size wonton cup form before. So of course I copied her and did the same thing and oh my pizza-loving heavens, these crispy little cups filled with all things wonderful when it comes to pizza were incredibly delicious. Don’t worry, he had already eaten at least 6 of the magically wonderful appetizers and I was simply trying to teach him some self-control. Adaptable to fit your pizza visions (meat lover’s, Hawaiian, all veggie?? 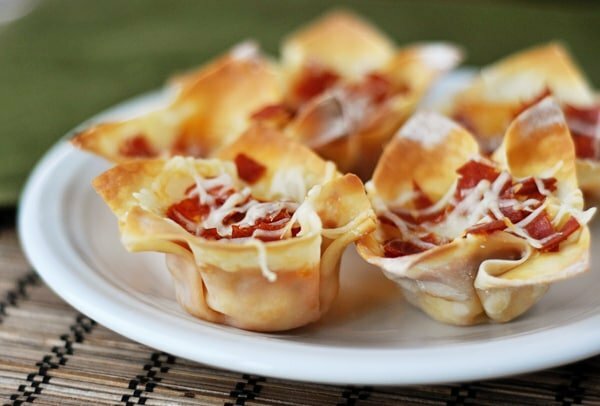 ), these pizza bites are bound to be the hit of your next party. I’ve included directions in the recipe for the bite-size version and also the dip style. Think of me with every bite you take. Preheat the oven to 350 degrees F. In a small bowl, whisk together the cream cheese, oregano, basil and garlic. Lightly grease a mini-muffin tin pan with cooking spray and press one wonton wrapper gently into the muffin tin, carefully but firmly pressing it into the sides of the cups. Bake the wonton wrappers for 4-6 minutes, until lightly browned. Remove the pan from the oven and keep the wonton wrappers in the mini cups. Dollop a teaspoon or two of the cream cheese mixture into the bottom of each wonton cup. Sprinkle mozzarella cheese over the top of the cream cheese mixture. Top with a teaspoon or so of the pizza sauce. Sprinkle with parmesan cheese and chopped pepperoni. Bake for 10 more minutes until the filling is bubbly and wonton edges are golden brown. Serve warm! ½ cup of the parmesan cheese over the cream cheese mixture. Spread the pizza sauce over the cheeses. Sprinkle with remaining cheeses. Top with pepperoni and other veggies or pizza toppings of your choice. Bake until hot and bubbly, about 20 minutes. Serve warm with tortilla chips, baquette slices or crackers. These pizza bites can also be made in a shallow baking dish as more of a dip versus finger food. Also, feel free to tailor toppings to your tastes. The sky's the limit when it comes to pizza! Where did the ingredient list go? I was going to make these tonight for a birthday party! Sorry, Beth! Not sure why it disappeared – I just updated the recipe. Just made these as a late lunch while watching football.. 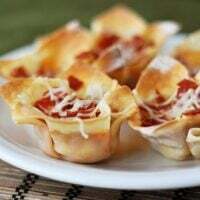 I halved the cream cheese recipe and since I didn’t have any won ton wrappers I used reduced fat crescent rolls.. Place each triangle of roll in muffin tin tops with cream cheese, mozzarella , pizza sauce, pepperoni and parm. Bake at 350 for 15 min.. Very very tasty!! (Yield 8 pizza cups). Made these for our Super Bowl party (along with a few other recipes from your site) but it was this recipe that will bring you a number of new readers tomorrow. They all asked where I got this recipe 🙂 I worried that the wonton cup would be dry and brittle, but it was really the perfect vehicle for this. Made these for my Christmas party and I had a lot of compliments on how good they were! 🙂 Will def. keep them in mind for future gatherings. Ok, at event #2 these were a huge hit! Still not my cup of tea but with a few tweaks they could be. AND got a request to make them for a third event-an Eagle Scout award ceremony. Brought these to Boy Scouts potluck last night. Nowhere near as popular as the bacon wraps. They are ok, I think I’d skip the cream cheese dip stuffing and go straight to pizza toppings, cheese and sauce only myself. Can’t win with every recipe, love so many of your others though! That 7-layer dip looks like another in the winner column! Okay. These are a littel bit to die for. Loved. We used Hormel’s mini turkey pepperonis too, which work perfect for these little guys. Alicia – it seems like it may be an issue of oven variance or longer baking time needed in that first step. Perhaps my oven bakes on the hotter side because the bottoms were slightly crispy after they came out of the oven. Sorry you didn’t love them! These little snacks weren’t our favorite. They were cute but the bottom of the wonton wrapper was too “raw” tasting, really soft and chewy. Maybe I didn’t cook them long enough the first time, although I cooked them for almost 8 min. Like my husband said though, “not every recipe can be our favorite” and we DO have a lot of favorites from you. Did you use the big wonton wrappers or the small ones? MIchelle – I’ve only ever seen one size of wonton wrapper. The kind I use are about probably right around 2 1/2 inches square. I LOVE this idea! I’m all about any form of pizza! My kids are going to love these! Can you imagine one of these filled with spinach artichoke dip? YUM! Agreed! Love anything in a wonton. These look great! I so glad you loved this recipe enough to post it, Melanie! Now when I make this I will have your gorgeous photos to look at! 🙂 This really is a fun recipe, and it is always gobbled up both children and adults!